Alain Fichot has been a sculptor for more than 30 years. He began working with sandstone, but his attention quickly shifted to porcelain and, more specifically, research into glazes. He is particularly fond of the crystalline glazes which experienced great success in the 1900s, including at the Sèvres Manufactory. This technique, which had fallen into disuse, is rising from its ashes in a few contemporary workshops. For Djélem, Alain created a very pure form to communicate the world of SULÉKÓ stripped down to the basics. These serve as a canvas for the crystalline glazes which will adorn them with colour-changing crystals. After being fired for the first time, at low temperature, the porcelain sculptures are dipped in a glaze before being fired at high temperature. The glaze is composed of different metal oxides. The composition varies according to the desired colours and the firing conditions. 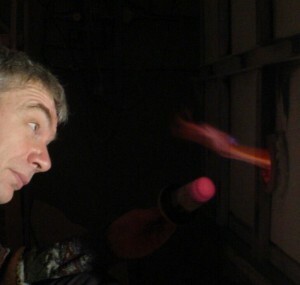 Alain Fichot prepares a zinc-based glaze which he fires at 1260°C. The crystals are created in the molten glaze as it fuses around the sculpture. Each component of the glaze turns liquid, completely covering the piece. A gradual cooling of the furnace will allow the crystals to develop. Stabilizing the temperature makes halos appear. The firing environment, with the parts being allowed to smoke in the furnace, will change the colours and create a pearly appearance. The art of crystalline glazes requires patience and a lot of attention. Each object is unique – the glazes form almost magically, blending into each other in a different way every time.